« Hackers Gone Wild, Where’s the Security When You Need It? Earlier this month Apple held its annual Worldwide Developers Conference, during the event Apple unveiled the new features of iOS 5 which is set to arrive later this fall . Although the much anticipated release of the iPad2 had come and gone back in March, the news of the newest iOS has seemed to spur iPad2 sales. At a price range set from $499-$829, these devices are definitely an investment that is worth protecting. 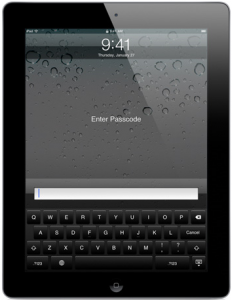 The following are ten tips to help ensure the safety and protection of iPad devices. The list covers both physical and virtual security so that customers can hopefully prolong the life of their device and be able to take full advantage of the upcoming iOS improvements. The iPad Smart Cover isn’t a customer’s only choice however it seems to offer the most protection along with usability. In addition to providing protection, the Smart Cover can also be transformed into an iPad stand with various positions, activate the sleep mode when covered, wake the device when uncovered, grip the iPad using built in magnets, comes in a number of colors and is available in two different materials. Users can also choose to use full shell cases for heavy duty protection or portfolio and envelope cases for the professional environment. A case or cover doesn’t necessarily mean the screen is fully protected. Screen or scratch protectors are well worth the purchase and not only do they prevent scratches but they have also been known to prevent the screen from shattering on impact. Prior to the release of the iPad2, Apple had stopped selling all anti-glare and screen protection film as what was thought to be a way to advertise the iPads screen durability. However screen protectors are still available through other companies, the trick is finding one that provides durability and is easily adhered to the iPad without causing damage. It may seem like common sense but some people still leave their iPad unattended or believe it to be safe in their car. A car is not a safe place to leave expensive devices, leaving your device in sight and unattended will only entice someone to break in and steal it. In addition to passwords, iPad owners can also use security locks and security cables to provide extra protection when not in their possession. At the very least all users should utilize the password option to protect their information and data. To configure the password settings go to Settings, General, and Passcode Lock. Once the password option is activated the passcode will be required when restarting the device, waking the device, and unlocking the screen. Users can also specify how many times the screen must be locked before activating the password prompt. A typical passcode has four digits however they can be changed to a longer alphanumeric code by disabling the simple passcode option. The iPad2 comes with a find my iPad app that lets the user locate a stolen or lost iPad as long as it’s still operational. Users can also determine how many password attempts are acceptable before disabling the device or remotely erasing the data from the device. Try to avoid using the common passcodes like 1234 or 0000. The auto – lock will activate the lock automatically after the iPad is inactive for the amount of time specified by the user. If someone does happen to acquire your device then these appropriate security settings along with an adequate password will at least protect your information. When surfing the Internet from your mobile device there are several options that provide extra protection. For example turning off the Auto-Fill option in the Safari Browser settings will disable the iPad from remember passwords or other critical information. You should also check to make sure that your pop-up blocker is turned on as well as the fraud warning feature. When it comes to accessing websites and email attachments be sure to practice good judgment. Users can also clear browsing history, cookies, and cache so that no information is stored. It is extremely important that you perform all available updates not only for the iOS but for your iPad applications as well. Updates are often released to resolve vulnerabilities and to protect users against newly discovered malware like viruses and spyware. Updates for Apps can be performed by accessing the app store and selecting update all under the update menu. Performing routine backups in iTunes can help protect your information and prevent data loss. In the event that your data or device is lost, corrupted, or stolen, users will still have access to it on their PC’s. The upcoming iCloud can also be used to store backup information. While not using Bluetooth it is recommended that you turn off the feature. Allowing Bluetooth channel to remain open can potentially create a vulnerability that is susceptible to intrusion. Consider purchasing apps that provide enhanced security. Here’s a list of 50 Security Apps that perform functions like storing passwords, activating alarms, monitoring business transactions, and safe web browsing. Hope these tips help keep your device safe and your information protected. For more details check out Apple.com and keep an eye out for Apple iOS 5 this fall! These security tips are not limited to only the iPad2, many of them can also be applied to the iPad, iPhone and iPod touch devices. This entry was posted on Tuesday, June 21st, 2011 at 2:36 pm	and is filed under Information Security, Mac, iPad. You can follow any responses to this entry through the RSS 2.0 feed. You can leave a response, or trackback from your own site.